Update 1/1/2016: This program has been closed as a result of a lack of funding. If you are facing foreclosure on your primary residence, contact the HomeOwnership Center of Greater Dayton. If you belive you have encountered lending discrimination when attempting to secure a loan for your primary residence, MVFHC may be able to help you — to speak with us about a lending discrimination issue, call 937-223-6035. 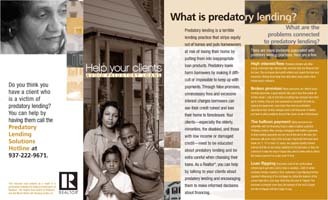 The Predatory Lending Solutions Project is a service of the Miami Valley Fair Housing Center to assist people who are victims of predatory loans. Do you think you might be a victim of predatory lending? Are you uncertain as to whether a mortgage you are considering is a predatory loan? 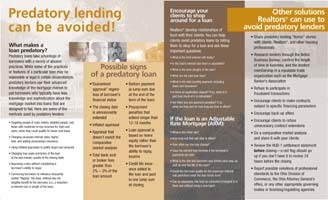 Get information about predatory lending by visiting mvfairhousing.com/dontrisk, or call MVFHC at 937-223-6035.